Miss Ben and Jerry's? 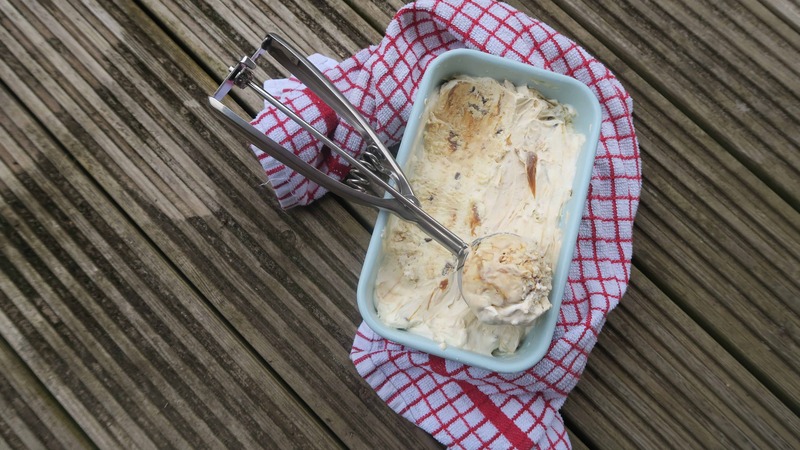 Make your own gluten free cookie dough ice-cream, no churning necessary! Miss Ben and Jerry’s? 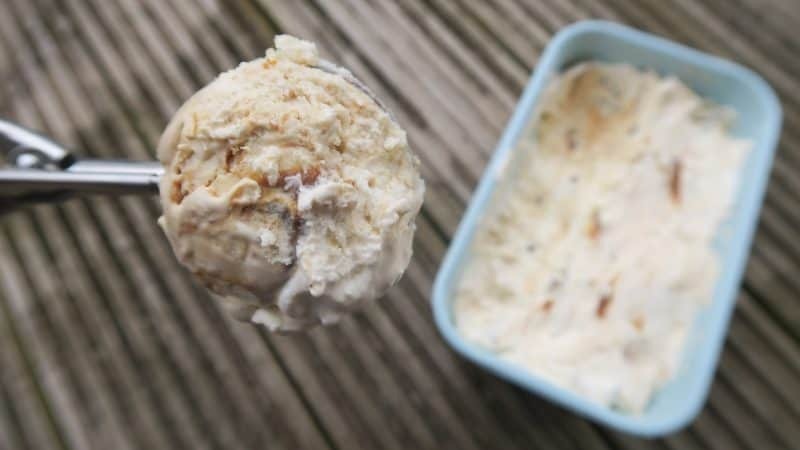 Make your own super easy gluten free cookie dough ice-cream! 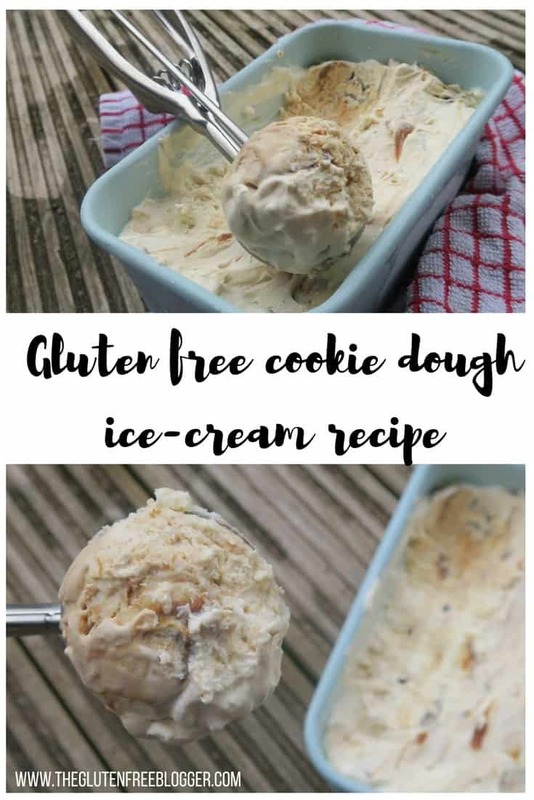 As a coeliac, there are several things I silently hope and pray will one day appear in the supermarkets – and gluten free cookie dough ice-cream is one of them. Every week I watch my boyfriend Steve plough into a tub of Ben and Jerry’s cookie dough ice-cream and feel a little bit of silent resentment. Ok, I’m probably not that silent about it, but you get my gist! Aside from doughnuts, Malteasers, fresh croissants, and noodles (yes, I have a list!) cookie dough ice-cream is about the only thing I’ve desperately wanted to be gluten free. So when I saw the brand new Whole Creations gluten free cookie dough in Morrison’s, freshly baked cookies were the last thing on my mind. Oh no, I was already churning up some ice-cream in my head and throwing chunks of this into it. The first dilemma – no ice-cream maker. 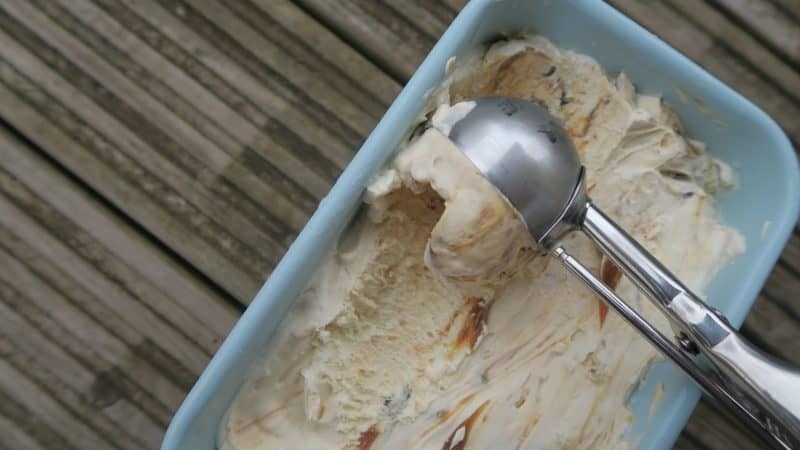 But fear not, it turns out creating a no-churn ice-cream is ridiculously easy. The secret? Condensed milk. Just add this sweet ingredient to your mix and it will freeze perfectly. Scoopable ice-cream in just a matter of hours and no icy-bits. Perfect! And while gluten free cookie dough ice-cream was the dream, I couldn’t resist adding an extra layer of yum with some Dulce de Leche whirled in for good measure. It as a perfect pairing and I loved seeing the swirls of sauce as I scooped it up. And I’m pleased to report that Ben and Jerry’s Superfan Steve actually said this is BETTER than the real thing. I was gobsmacked – I hoped he’d like it but I don’t think you’ll ever truly realise what high praise this is coming from him! As I’ve never been able to eat Ben and Jerry’s cookie dough ice-cream I asked for some feedback. He said it was creamier and richer, but the cookie dough was spot on. SPOT ON I tell you. 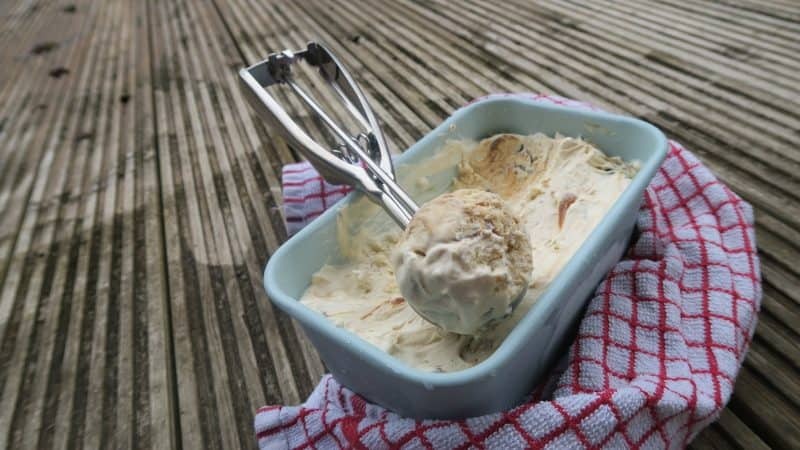 While I’m still holding out for a gluten free Ben and Jerry’s cookie dough ice-cream one day, this recipe is so easy to make it’s no bother at all. It takes about five minutes to whisk up the mixture and chuck it in the freezer, and once it’s frozen it’s ready to just scoop at any point. Or, if you’re like me, you keep going back into the freezer with a spoon every half hour! I’ve posted the recipe below, and here’s a little stop-motion video I made for my Instagram showing the ice-cream making process! Feel free to head on over there and give me a follow too! 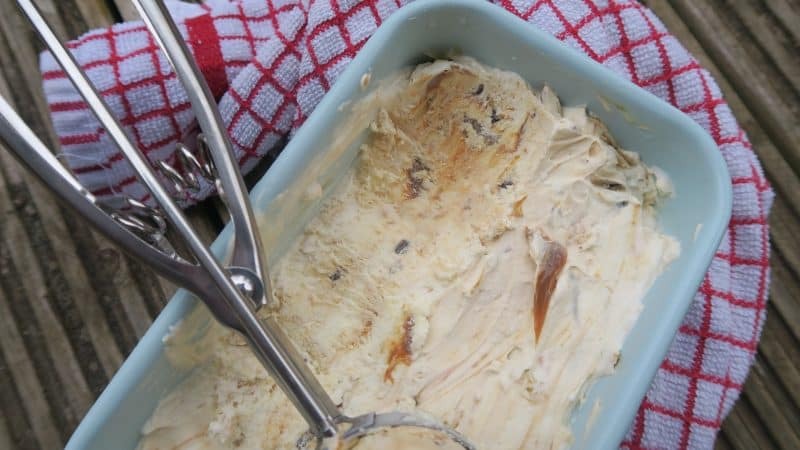 If you wish you could eat Ben and Jerry's, why not make your own gluten free, no-churn cookie dough ice-cream? It's so easy! Add the condensed milk, double cream and vanilla extra to a large mixing bowl and beat with an electric whisk until thick. It should be quite stiff and a bit like clotted cream. Chop the cookie dough into chunks and fold into the mixture. Spoon the dulce de leche into the bowl and mix until it swirls. You don't want to mix it in entirely but enough so that there are swirls of it through all the ice-cream mixture. Spoon into a loaf tin, cover with cling film and freeze for a couple of hours until solid. For best 'scoopage', remove from the freezer about 10 minutes before serving. See, it doesn’t get much easier than that! Perfect gluten free cookie dough ice-cream in a matter of hours. I’d love to see your creations if you give this a go – you can share them in my Facebook group or tag me on Instagram! And if you fancy making some other sweet treats, there is plenty more inspiration over on my Recipes page. Now I am 100% with you on the gluten free wishlist concept. We cannot have Maltesers and authentic Croissants are nigh on impossible. But doughnuts? They are solved! Is it possible you have not sampled the gluten-free doughnuts from Borough 22? Try them, love them, cross them off your list!